Providing services to people that want to establish online scrapbook memories of friends and relatives. Memories can include pictures, stories, sound, or video. Professionally written, edited, printed and bound biographies and family memoirs, including family photos. Provides an opportunity to celebrate the life of a departed family member and friend. A member of the OldX family of sites. Features antique jewelry and watches. Photos and home movies will be used to create a music video on VHS and/or DVD, and digitally archived to protect memories. Maryland artist Sherry Feldman turns your memories into mosaic art that will last a lifetime. Creations integrate invitations, family photos, anything in a mosaic setting. Custom-crafted miniature scenes of actual photographs, announcements, invitations and memories under glass domes. Conversation game for women encouraging them to reminisce about lost loves, analyze complex family relationships, discuss the ups and downs of their friendships, reveal their quirks, re-live high school and college memories, and dish the dirt. Sample questions and how to order. Family crests and coats of arms for over 2300 Irish family names available as e-mailed graphics files or on CD-ROM. Combines old family photos, slides and home movies with special effects, music and text to create a family history music video. Reproduction maps that show actual family home locations identified by owner. Useful for history buffs, family historians and genealogists. A family history trivia game. Family members and friends fill out permanent trivia cards about themselves and family history for others to answer. Microsoft Publisher templates for a 20-page Family Reunion Booklet. Includes family tree, photos, games, quotes, planning calendar, address/telephone directory and bios. Provides bronze engravings of family histories with birthstones set beside each name and birthdate. A family of artists paintings including mamy that are for sale. Made from family photos to make a handcrafted family heirloom. Offers a guide to editing and publishing a family newsletter. Photographs of authentic Irish Pubs that match family names. Sells family-oriented travel gear and equipment. Offers a wide selection of supplies and accessories for family heritage. Also tips and ideas. How to make a family tree video. A sculptural family portrait, made to order from photos, by artist Melanie Jeffs. Products for traveling with kids, either by car or air including luggage, travel games, car top carriers, child car and booster seats, and family guides. Parental controls including TV Guardian bad language filter, Weemote, and TV Allowance. Also family movie reviews and free internet filtering programs. If the business hours of Family and Friends to Remember in may vary on holidays like Valentine’s Day, Washington’s Birthday, St. Patrick’s Day, Easter, Easter eve and Mother’s day. We display standard opening hours and price ranges in our profile site. 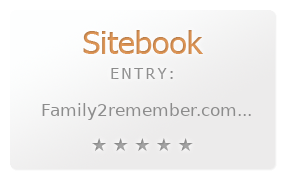 We recommend to check out family2remember.com/ for further information. You can also search for Alternatives for family2remember.com/ on our Review Site Sitebook.org All trademarks are the property of their respective owners. If we should delete this entry, please send us a short E-Mail.